With their daily use, kitchens can get dirty fast. Even if you spend the time to meticulously clean up after every meal, after a while your kitchen will still need a deep clean. Food and grease end up sticking to the stovetop, while stray spills tend to gunk up the floors. As the place where you prep and eat your food, the last thing you want is to let it stay dirty or mess it up even more with toxic cleaning products. Instead, you can clean your kitchen with a homemade kitchen cleaner. Most of the household cleaners that you can purchase at the store, from an all-purpose cleaner to oven cleaners, contain a toxic mix of harmful chemicals and ingredients that have been banned in the European Union and other countries. From allergy and asthma-causing substances to carcinogenic chemicals, the ingredients in commercial house cleaners aren’t what you need to have in the area where you eat your food. You can make a DIY kitchen cleaner with all-natural ingredients that you probably already have in your kitchen pantry and that have the same cleaning power as commercial house cleaners, without the harsh chemicals. You can easily make some homemade cleaners for everything in your kitchen, from the refrigerator to the kitchen counter to the floors. With the help of common ingredients like white vinegar, baking soda, and dish soap, you can make a variety of natural cleaners that will get all your kitchen surfaces clean. All you need to clean all the surfaces in your kitchen is a rag and a simple and effective all-purpose cleaner. You can use the following cleaning solution to clean and disinfect your entire house. This natural kitchen cleaner is gentle enough to apply to scrub down your appliances, countertops, walls, table, and even the sink. In a spray bottle, combine the ingredients and allow to infuse for a week. Use it to clean trash cans, remove hard water stains, wipe away smudges, and wash your countertops. The acid from the lemon rind adds an extra bit of cleaning properties, which make this homemade kitchen cleaner perfect for removing stubborn stains. Between the fingerprints, grease buildup, food smudges, and general opening and closing, your kitchen cabinets take a beating over time and can get extremely dirty. To keep them clean, you only need a few common household ingredients. 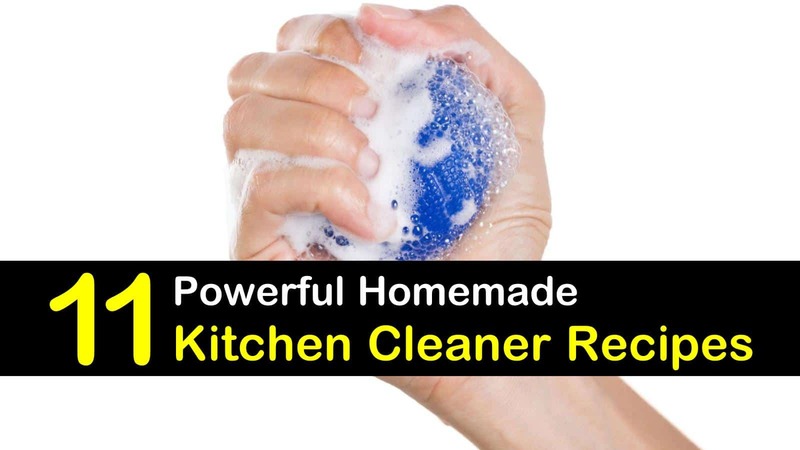 This homemade kitchen cabinet cleaner recipe is easy to make and will get your cabinets clean. Add the Borax to the bowl, then slowly add the white vinegar. Next, add in the dish soap and mix well to combine the ingredients. Dampen the clean cloth with the cleaning solution and gently clean your cabinets. Make sure you give the areas around the knobs and corners extra attention. Finally, use a damp, clean cloth to wipe down the cabinets and remove any suds or leftover residue from the cleaner. Vinegar is praised as being the best all-natural kitchen cleaner, and while it is an excellent ingredient for many DIY cleaners, it isn’t safe to use on all surface. Since vinegar contains acetic acid, it can damage certain materials like granite and marble, not to mention vinegar has an incredibly overpowering scent that can make your entire house smell for hours. If you have hardwood floors, and can’t use a kitchen floor cleaner that contains vinegar, or you don’t want to put up with the smell of vinegar throughout your house, here’s a natural cleaning solution that uses Castile soap instead. Add the hot water to a five-gallon bucket and add the liquid Castile soap to the water, followed by the tea tree oil. Gently stir the solution, avoiding a ton of bubbles. Dip a mop into the floor cleaner and mop the floor. Try to avoid saturating the mop when cleaning. After you’ve cleaned the floor, discard the floor cleaner and fill the bucket with another two gallons of hot water and wipe the floor to remove any residue. If you’re not concerned that vinegar will ruin your floors, here’s basic kitchen floor cleaner that requires just three ingredients. You can use this basic floor cleaner on tile, laminate, sealed wood, and linoleum. Pour the hot water into a bucket and add the distilled white vinegar and the lemon essential oil to the solution. Stir the ingredients to combine. Dunk a mop into the bucket, wring it out and mop the floors. The vinegar and lemon juice will sanitize your floors and make them shine. When it comes down to cleaning your granite countertops in the kitchen, you have to be careful what you use. Your granite can be easily damaged by any kitchen counter cleaner that is acid-based, but it isn’t too hard to make your own solution to clean granite countertops without worrying about causing damage. Add the rubbing alcohol to the spray bottle, then add the dishwasher detergent. Gently swirl the container to combine the ingredients. Slowly fill the rest of the bottle with tap water. To reduce suds, let the water hit the side of the container as you fill it up. Attach the lid and spray your countertops. Use a clean microfiber towel to wipe the counters. Many homes have stainless steel sinks and appliances. Stainless steel looks beautiful in the kitchen, but unfortunately, it can quickly become dingy and covered in fingerprints and smudges. Rather than cleaning these surfaces with a commercial cleaner, you can make a homemade stainless steel sink cleaner to clean all the stainless steel surfaces in your kitchen gently. Pour the water, vinegar, and baking soda into a spray bottle. When combined, the ingredients will foam and fizz a bit. Once the foaming has subsided, replace the lid. Using a fine mist, spray the stainless steel with the cleaner. Use a dry, clean cloth to wipe the solution following the grain of the steel. To prevent streaking, make sure you thoroughly dry the steel with a clean, dry towel. After you’ve cleaned the surface, add a drop of olive oil to a clean cloth and wipe down the surface for some extra shine. Degreasing your kitchen from time to time is a must on the to-do list. Instead of buying the expensive commercial degreasers that are full of harsh chemicals, you can use a combination of vinegar, baking soda, and liquid soap for this useful kitchen cleaning recipe. The vinegar is an effective sanitizer, while the liquid soap is an excellent degreaser and stain remover. The baking soda in this recipe makes a gentle abrasive. You can even add several drops of essential oil to add a clean, fresh scent to this kitchen degreaser. Use warm water to rinse the spray bottle. Add the vinegar, liquid soap, and baking soda. Pour in enough warm water to fill the rest of the bottle. Add the essential oil to help with the scent of the vinegar. Replace the top and gently shake the bottle to combine the ingredients. Spray the mixture onto the surface and use a clean sponge to wipe the area. Run a clean dishcloth under warm water, wring it out, and then wipe it over the cleaned surfaces. This powerful sink cleaner will work against even the most stubborn dirt and odors. It works just like Soft Scrub, but without harmful and toxic chemicals, making it a nice eco-friendly alternative. It combines baking soda, hydrogen peroxide and Castile soap, three dirt-hating ingredients that will get your kitchen sink sparkling clean. In a large measuring cup or bowl, combine the baking soda, hydrogen peroxide, and Castile soap. Stir the ingredients until the cleaner resembles a thick glue. Pour the cleaner into the jar and seal. This scrub will harden if exposed to air for a prolonged period. If it is kept in a sealed jar, it can last for several months. The cleaner will expand in the first 24 hours, so you’ll need to leave at least three inches at the top of the container to allow for this expansion. To use the cleaner, apply the amount desired to a scrub brush or clean cloth and apply to the dirty surface. Allow the sink scrub to sit for several minutes, then wipe the surface clean with a damp cloth. Nothing can ruin the impact of your otherwise clean kitchen like dirt between the tiles. Homemade grout cleaner recipes, like this one, do a great job of getting the grout between your tiles clean without using harsh chemicals. No matter how much you clean your kitchen, it will always look dingy if it is plagued by dirty grout. With just a handful of ingredients that you probably already have in the house, you can make a homemade grout cleaner that will work just as well as commercial cleaners. Take the lid off a small squeeze bottle and pour in the baking soda. Then slowly pour in the hydrogen peroxide. The baking soda will work to remove tough stains, and hard water buildup and the hydrogen peroxide will clean and brighten the grout to remove any discolorations. Add the dish soap and then replace the lid. Shake the bottle to mix the ingredients. Apply the grout cleaner in a fine line and allow it to sit for five minutes. Use the sponge to wipe the mixture off. To remove any leftover residue, rinse with water. There are a lot of ingredients that can be used to clean the glass in your kitchen but used separately; they all have drawbacks. Vinegar helps to remove dust and water spots, but won’t take care of any sticky residue, and it tends to leave streaks. Rubbing alcohol is a great cleaner, but it can be harsh and doesn’t smell that great. The secret to creating a homemade glass cleaner that works is to combine the ingredients. Add the rubbing alcohol, water, apple cider vinegar, and a few drops of your favorite essential oil to a spray bottle. Don’t use a spray bottle that contained another kind of cleaner to eliminate the possibility of a toxic chemical reaction between new and old ingredients. Label the bottle and store it in a cool, dry place. When you’re ready to use, spray the glass and wipe clean with a clean microfiber cloth. For a simple and effective cleaning product, you can make your own disinfectant wipes and get rid of the toxic commercial wipes that you’ve been using in your home. These are great for doing a quick clean because they can kill any bacteria that is lurking around while eliminating dirt and grime. Add the scraps of fabric to the jar. In a small bowl or measuring cup, combine the water, white vinegar, and essential oils. Pour the solution into the container to soak the cloth scraps. When you’re ready to do a quick disinfecting clean, pull a scrap of fabric from the jar and get to work. When you’re finished cleaning, throw the dirty rag in with a load of laundry like towels. If you have marble or granite kitchen counters, you should not use these wipes to clean them because the vinegar in the solution can damage the material. Having a clean kitchen is important because it is where you and your family cook and eat meals. These 11 cleaning recipes will get the surfaces in your kitchen so clean you can eat off them. They are all incredibly easy to make and use everyday ingredients that you probably already have in your home. Don’t let your kitchen remain dirty a minute longer, whip up these simple kitchen cleaning recipes and enjoy a sparkling clean kitchen in no time. 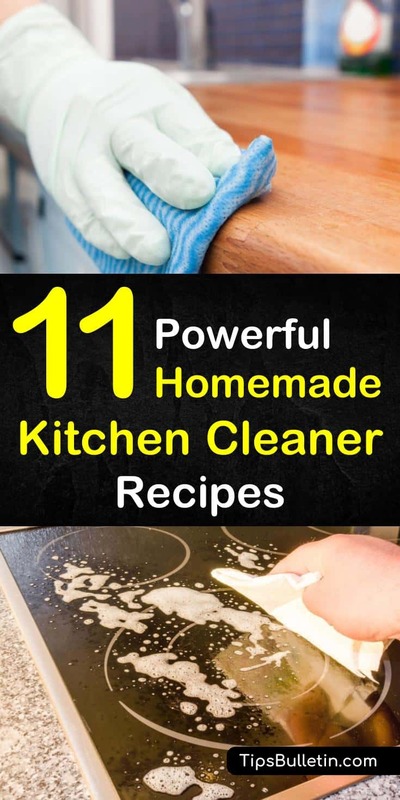 We hope you liked our different homemade kitchen cleaner recipes that you can make at home. If you found these recipes useful, please feel free to share the DIY kitchen cleaners with your family and friends.